The New England National Scenic Trail (NET), when completed, will extend from Guilford, Connecticut, to (hopefully) Grand Monadnock Mountain in New Hampshire, a distance of around 250 miles. The NET was created by combining three trails that have been in existence for half a century. They are the Metacomet-Monadnock in Massachusetts and Connecticut, and the Mattabesett in Connecticut (the Triple-M). The Menunkatuck Trail, under construction and soon to be completed in southern Connecticut, will extend the NET to the shores of Long Island Sound. The NET is New England at its finest--stunning views of glades and unfragmented forests along traprock ridges. Passing over mountain summits, it wends its way down and through fertile river valleys, by villages, farmlands, lakes, streams, and numerous waterfalls. Historical landmarks from centuries past, both native and colonial, are to be found all along. And so, as to the wonder and beauty Nimblewill will soon experience (and take pictures and videos of, and write about), don’t take his word for any of this! For an absolutely captivating read about trekking the NET, click on: A Serene Thread of Paradise, by Tom Tella. Of the eleven National Scenic Trails (with nearly 19,000 miles combined distance), the New England Trail is the shortest by far. 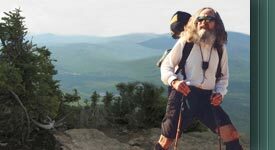 With his recent successful thru-hike o’er the Ice Age Trail, the New England stands as the last of the eleven not yet hiked by Nimblewill. So, as might be expected, he’s setting out to hike it. On August 28th he began his northbound trek--Odyssey 2012 NET. So, please check back often, then follow along. Nimblewill will be delighted to have your company!